ABSTRACT: Schenkerian analysis gives priority to structural harmonic and voice-leading closure in tonal works, but composers have found other ways to simulate (and dissimulate) structural closure for dramatically expressive purposes. After a brief look at an example by Beethoven (the coda to the first movement of op. 2, no. 1), I focus on interpreting closure in two Romantic piano pieces. In his Prelude in A minor, op. 28, no. 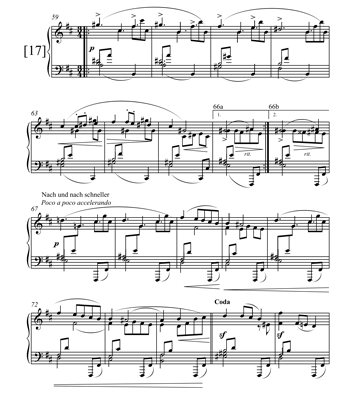 2, Chopin plays with three different closural gambits: dissolution to silence, a false Picardy third close on the dominant, and a final V7–i cadence in A minor. The latter two options are also marked by shifts in level of discourse, and may suggest two commentaries (beatific consolation vs. tragic desolation) on the funereal trajectory of the work. In the penultimate dance of his Davidsbündlertänze op. 6, Schumann achieves both thematic and tonal closure, complete with the cyclic return of waltz no. 2 and a passionately tragic coda suggestive of Florestan. But he expressively undercuts that strong closure to allow Eusebius the last word. The final waltz (no. 18) overflows not only its own formal boundaries, but also the formal closure of the set implied by no. 17, reversing the tragic coda to achieve a transcendently positive epiphany. I propose and illustrate performance options that can help project the expressive closural dramas in these two works by Chopin and Schumann. To perform a work’s closure involves more than providing suitable dynamic or temporal emphasis for a final cadence, especially in works where conventions of tonal closure are undermined and finality is problematized. When Chopin or Schumann simulate—or dissimulate—a series of potential closures before the actual end of a work, how might a performer project the expressive significance of these pre-closures as feints, or parts of a larger dramatic trajectory? In effect, how might a performer lead a listener to experience the appropriate significance of each presumed closure in a dramatically satisfying way? I begin with a comprehensive analysis and interpretation of the variety of musical elements and strategies that contribute to expressive meaning, to help explain expressive dramas of closure that go beyond tonal resolution. In reaching a more complete understanding of the expressive and dramatic issues involved, I briefly consider aspects of performance practice, as well as clues from the autograph and subsequent editions of the work. By offering my own performance of the Chopin and Schumann examples, I illustrate some of the pianistic options that can contribute to a coherent expressive interpretation of these two closural dramas. Beethoven’s codas often dramatize expressive closure by foregrounding a fundamental premise of conflict that underlies the sonata-form movement, just before its definitive resolution. This may lead, paradoxically, to the greatest dissonances heard thus far; their ultimate resolution is correspondingly more forceful. The first movement of Beethoven’s Piano Sonata in F minor, op. 2, no. 1, achieves its dramatically expressive closure in a coda of a scant few bars (Example 1), not only by summing up the rhythmic dissonance premised by the movement, but also by destabilizing the potential structural descent itself. What Schenker (2004) graphs as part of the early Urlinie for this movement is the structural upper-line descent from 5ˆ to 1ˆ (C–B –A –G–F). But the reprise of that descent in the coda is dissonantly harmonized with applied dominants and diatonic seventh chords, and what is foregrounded is actually the fully thematized descent from C to E-natural. First presented (as unresolved) in the opening theme (measures 7–8), the descent is also used at a deeper level to structure the development section’s retransitional drive to the dominant, and it returns to the foreground in the brief coda, resolving to tonic only in the last measure of the movement. (2) Thus, strategies of thematic closure prolong tonal closure and justify the extension created by a highly charged coda. Expressively, the tragic trajectory of this movement finds tonal closure, but since the final cadential descent has been undermined by heightened rhythmic and pitch dissonance, the ultimate tonal closure may be interpreted as reinforcing the tragic expressive trajectory of the movement, as if a horrific Fate were inexorably approaching and capturing the protagonist in its ultimate, emphatic gesture of closure (like a stone door slamming shut on a tomb). Note that this interpretation infers an “external” agency that is acting upon the “internal” agency of a protagonist; ultimately, both virtual agents may be integrated into a larger subjectivity, as projected by a single performer. The melodic line in the Prelude continues with a varied sequence of the lament motive, and then “flat-lines” in measure 6, as the dotted rhythmic repetition of a single pitch stylistically references not only a funeral march, but death itself (although my metaphor of “flat-lining” is clearly anachronistic!). Additional examples of this rhythm within a slow, minor-mode march, topically evoking a funeral cortège, can be found in Chopin’s early Marche funèbre (Example 3) and his famous funeral march from the Piano Sonata No. 2 in B minor, op. 35. An abrupt tonal shift of the ostinato to B minor in measure 8 initiates a larger (metrically displaced) sequential treatment of the entire opening phrase in the right hand, this time progressively accumulating dissonance in its denial of an analogous move to the relative major. The bitterness of grief is foregrounded here by a crescendo above the most dissonant harmonic formation thus far, in measure 11. This expressive crisis avoids closure by a legato enjambment of the accompaniment into the third phrase, beginning in measure 13. The overlap is also intensified by dissonant energy, enhancing the obsessive and inexorably tragic character of the accompaniment. The accumulated intensity gradually yields under a long diminuendo, from measure 13 to 18, anticipated by the painful reversal from C to C-natural in the left hand in measure 12. If that chromatic reversal suggests frustrated resignation, the gradual diminuendo may further the sense of yielding to sullen grief. Another reversal in measure 14 pulls F down to F-natural in the bass, and the resulting augmented-sixth chord (F–A–B–D ) pulls the third phrase along to its ultimate tonal goal via a cadential in A minor (downbeat of measure 15). But the third phrase goes awry amid a more enigmatic statement of the opening lament motive: in measure 16, an anguished lowered-6ˆ (F-natural) substitutes for the lament-oriented lowered-7ˆ (G). The dissonant stab of F-natural (marked by the crescendo wedge) produces enough friction to grind the cart wheels to a halt in mid-phrase. An a cappella continuation of the lament melody leads to a point of no return in measure 18. Here, memory of the wheel-turning ostinato blurs into metaphorical distance, a specific effect achieved by strict observance of Chopin’s only pedal indication. This dissonant stoppage creates what I call a negative cadence, an initial expressive closure that is marked by dissonance (instead of resolution) and in this case, dissolution (not merely liquidation). (8) There follows an abrupt and deathly silence—an acoustical absence that suggests a moment of recognition: perhaps of existential horror (“Is this death?”). The music picks up with a tentative sequence of the lament’s continuation phrase, gradually winding down in tempo as the upper line slumps from D to B in measures 20–21. The gap between 4ˆ and 2ˆ, (D and B), where we might have expected an inexorable linear descent, is also a marked expressive feature of Prelude no. 4 in E minor. In both preludes, the apparent gap in a structural linear descent may be associated with absence, and hence loss. With the suspension on the downbeat of measure 21, a cappella monophonic texture gives way to two voices, providing a pair of religioso topical cues: the resolution of the suspension on beat 3 and the textural expansion into hymn-like homophony. This surprising change of texture has a closural effect, and the progression of major triads is appropriately and definitively positive. Even as the new texture shifts out of the prevailing discourse, as if to comment on it, the B-major triad’s dominant function projects a Picardy-third effect onto the E-major triad as potential tonic in measure 22 (despite its own dominant function in the larger scheme). This closural effect supports an initial interpretation of the trajectory as leading to spiritual acceptance—a positive resignation that, given the religioso cues, may even suggest spiritual abnegation. (9) This interpretation of expressive closure is enhanced by the root-to-root cadential implication of B to E (an unusually strong “embellishment” of V this late in the piece) as well as the written-out ritard to a half-note duration in measure 22. (10) The suggestion of an expressive genre that takes us from grief to consolation was foreshadowed when the funeral-march dotted rhythm in measure 6 moved to G major. (11) Note that the last occurrence of the funereal rhythm in measure 21 is clear of any ambiguous modal mixture; the repeated notes are instead heard in the context of a religioso closural suspension (an implied 4–3 above E) in major. If the work had ended after the E major triad in measure 22, we might have interpreted the dramatic trajectory as extreme grief ameliorated by religious consolation and acceptance. Even without such a dramatic break in performance, however, one can set off this final cadence in order to emphasize its negative emotional impact, undercutting the previous gesture of spiritual acceptance. Strikingly, the ultimate V7–i cadence—here, the proper structural close—is heard not as “resolution” of the tragic, but, in rhetorical opposition to the previous consolation, as exemplifying an even more tragic desolation. As in the Beethoven, the door to the tomb closes, but here with devastating quietness. This is not at all the dramatic expressive closure Chopin had hinted at earlier with the move to G major in measure 6, or with the illusory ending’s Picardy-third effect on the dominant chord of A minor in measure 22. In effect, the Prelude features at least three different expressive closures, beginning with the dissolution to silence in measures 18–19. The last two, with their topical and textural contrast, might further be interpreted as shifts in level of discourse. (14) The Picardy-third closure serves not merely as the expected end of a tragic-to-transcendent expressive genre, but as a consoling commentary, by a narrative agent, on the preceding despair. (15) The final V7–i cadence, might then be interpreted as a meta-commentary by a higher narrative agent, reversing the “too easy” acceptance of that consolation. Thus, two levels of narrative staging may be understood as disrupting the discourse: one positive, but the other completely annihilating in its tragic force. A performance that would project this analytical interpretation must navigate and balance a progressive series of negative cadences or dissonant stoppages in measures 11–12, 16, and 18–19, before creating a positive shift to an illusory expressive closure in measures 21–22, and then dramatizing (with hints of narrative agency) the marked reversal to a negative, tragic closure in which the structural goal of A minor is dramatically cast as the abysmal reality one had hoped to evade. In my performance (Audio Example 1), I begin with a rather faster tempo than is typical in recordings, based on my interpretation of Lento within the context of the notated, cut-time meter signature, which specifies the tactus as the half note. But another factor supports my tempo decision: the long-held melodic tones, which will sustain further due to sympathetic vibration created by fundamentals sounded in the left hand, may nevertheless completely die away if the pace is too slow. Many performers use pedaling to promote the sustaining of these long notes, which obscures what I consider to be a very important interpretive element: the raw, creaking sound of the oxcart’s wheels grinding dissonantly and intermittently. The inner-voice “Dies irae” line also reveals itself more clearly if the accompaniment is not swimming in pedal. And finally, the special blurred-pedal effect in measures 18–19 would lose its marked, distinctive character and potential expressive meaning here, if used earlier. Rubato is typical in performances to mark the major phrase shifts (measures 8, 13, 20), but my performance emphasizes the abruptness of these shifts by minimizing timing breaks between phrase segments. In order for the obsessively turning wheels to sound inexorably tragic, I also avoid the extreme phrase-internal tempo fluctuations used by some pianists to accommodate the expressive placement of the melodic pitches (especially in measures 4 and 9). The crescendo in measure 11 helps to intensify the harmonic dissonance to a point of unbearable tension. 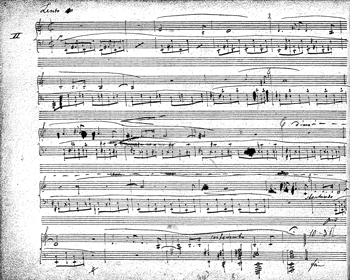 Chopin in the fair copy autograph (Example 2) scratched out the crescendo and redrew it as applicable to the right hand alone. The French first edition omits any crescendo here, whereas the German first edition begins the crescendo on beat two and the English first edition begins it on beat one. The Polish Complete Works edition (Example 4) reproduces the crescendo more generously, beginning from E at the end of measure 10 and going through the first three F s in the melody. Enhancing the dissonant intensification through a slight accelerando makes sense to me, both for the crescendo here and the smaller one leading to measure 16, which in turn emphasizes the abrupt silencing of the accompaniment in measure 17. The subsequent slentando (literally, “becoming slower”) is an unusual marking where one might have expected morendo or smorzando, although when combined with the ongoing dim., the effect is presumably the same. (16) The effect of dying away is enhanced by the pedaled recall of the ostinato; its Dies irae incipit, in correct intervallic and scale-degree transposition for the first time, adds a haunting spectre of doom to the tragic dissolution. The cart and its memory appear to fade into the distance with the pedaled wheel-motive fragment in measures 18–19, leaving the mourner alone with the “absence” of death. Abrupt silence here is not merely an emblem of death, but also a programmatic acoustical effect as the turning wheels (of life, or the sufferings of life?) literally come to a stop. With an abrupt release of the ostinato, I project the moment as an existentially charged silence suddenly enveloping the mourning virtual agent. The sostenuto marking in measures 21–22 is not appropriately interpreted here as a tempo indication since, according to Clive Brown (1999, 372–73), sostenuto as a tempo marking in the nineteenth century was faster than lento. Rather, since the earlier slentando marking has already slowed the tempo, I take sostenuto, as Brown indicates Mendelssohn used it, as “an expression marking, perhaps calling for extremely legato execution” (Brown 1999, 373). I further interpret the sostenuto as implying a greater fullness of sound and a marked (broadened) emphasis on these pseudo-final chords. (17) In addition, I use special voicing for the G in measure 22, to emphasize its illusory Picardy-third character. (18) Then, assuming that this fullness must be countered dynamically, I interpret Chopin’s final cadence as sinking (via the legato connection to the previous triad) into the depths of despair (definitive, and fateful, A minor), and I use both timing and a subdued change of color to set off this ultimate, devastating shift in level of discourse to the inexorably tragic. Schumann also problematizes closure in his Davidsbündlertänze op. 6, but with a different set of strategies from those found in the Chopin prelude. 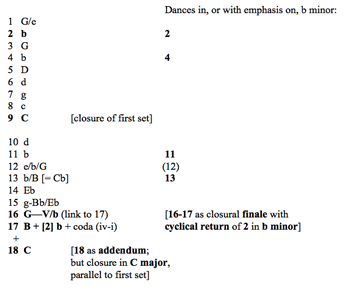 Here, the series of closural feints are at a higher formal level than in the Chopin, in that closure of an entire cycle is at stake, but they also create an unfolding drama of expressive closures. The drama differs from the Chopin in that the tragic is not only reversed, but the reversal holds, since a transcendently positive outcome is ultimately achieved. A quick overview of Schumann’s idiosyncratic tonal strategy for the entire set will establish the formal context for Schumann’s expressive closural strategies (see Figure 1). (19) Beginning with the oscillating tonic complex of G major/E minor for the first dance, Schumann moves to B minor for the second, and ends the first half with C major for no. 9. But it is the poetic second dance in B minor (“signed” after the double bar with “E.” for Eusebius) that Schumann chooses for his cyclic return, as a poignant memory arising in the middle of no. 17. B minor as closural tonic is foreshadowed already in the trio of no. 16, which begins on V of B minor and functions as a tempo transition and tonal introduction to no. 17 in B major. The expressive indication at the head of no. 17, “Wie aus der Ferne,” implies not only spatial but temporal distance, and hence reminiscence. 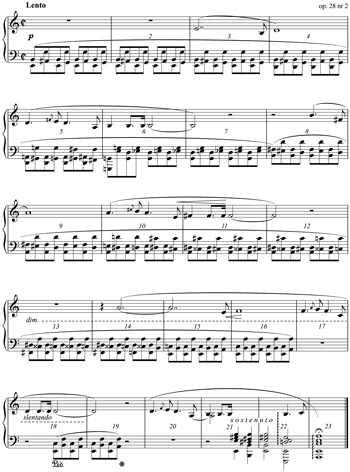 The expressively marked B-minor Ländler of the second dance is soon recalled, quite literally; it moves as before to B major at the double bar of its rounded-binary structure (see Example 6). But when the opening phrase of the Ländler returns to B minor, a gradual acceleration and crescendo transitions to a vertiginous tragic coda. Although a subito piano undercuts the final tonic, it receives a chilling (arpeggiated) plagal extension in multiple registers. Structural, formal, thematic (cyclic), and expressive closures appear to have converged in this coda, which has tragically reversed the beatific B major with which no. 17 began, and which is definitive and forceful enough to imply closure in B minor for the entire cycle. However, ending the cycle with no. 17 would fail to create symmetry with the implied first half of the set, which ended in C major (see Figure 1, no. 9). Furthermore, numerical symmetry would demand an eighteenth dance. Schumann appears to be striving for a deeper emotional experience than the prototypically tragic coda of no. 17 provides. Perhaps, since Florestan has just usurped Eusebius’s dreamy Ländler (the cyclic return of no. 2) with his increasingly passionate closure (the tragic coda), Eusebius is permitted to have the last word in no. 18. (20) Perhaps Schumann was also motivated by the desire to create a formal, tonal, and expressive parallel with the end of the first set, the dance in C major (no. 9) that Florestan had anticipated “with lips trembling sorrowfully,” according to Schumann’s textual insertion in the first edition. We have further textual evidence from Schumann for the implied narrative behind the final dance (no. 18). In the first edition, Schumann’s commentary sets the stage for no. 18: “Ganz zum Überfluss meinte Eusebius noch Folgendes; dabei sprach aber viel Seligkeit aus seinen Augen.” (“Completely overflowing [i.e., “as though to crown it all”—rather than “redundantly,” the translation found in Example 6, which carries a somewhat negative connotation] Eusebius thought [or “sensed”] the following, and with it, however, much bliss spoke from his eyes.”) Schumann marks this sense of transcendence with one of his signature style types: the dominant seventh over tonic fifth. (21) He also provides a tonal link to the B-minor conclusion of no. 17 by placing B in the upper voice of no. 18, now dissonant against the C pedal, as Charles Rosen perceptively observes (1995, 233). After the haze of this bichordal introduction, a halting, dissociated waltz only briefly clears to the C-major tonic before immediately turning toward the submediant, A minor, on the way to the dominant, G major, at the double bar. The waltz’s fragmentary melodic gestures enhance the sense of being somewhat “lost”; indeed, the waltz is meant to sound tentative, as though inwardly reflective within the microcosm of each one-bar gesture. The tune only begins to consolidate when a broken, two-voice counterpoint in measures 7–10 creates suspension figures that ameliorate the previously jagged contour and thus provide a fragile sense of linear continuity. The second strain of this rounded-binary form yearns for more: the purposeful bass descent in measures 11–14 is countered by dramatic yearning in the right hand, whose expanded gestures delay resolution of the implied suspensions. Expressive dissonance is prolonged through a retransition in measures 16–18 that fails to resolve the alto’s suspension of C over the dominant. Thus, the dissonant dominant blends seamlessly into a return of the introductory bichord at measure 19. Unlike the ending of Jean Paul’s Flegeljahre, in which Walt’s Eusebian naiveté is cruelly manipulated by Vult’s sophisticated treachery, this waltz ends happily. Ironically, Schumann’s most obvious programmatic element in the final waltz, the tolling of the midnight hour, is not actually referenced in the novel that helped inspire the set. The twelve strokes of midnight, a traditional signal for the close of a ball, sound on low C in the bass in measures 41 and 43–53; the Cs in the melody reiterate these twelve strokes canonically from measure 49 to the end. Each set of bells is launched by the respective voice’s arrival at tonic closure, suggesting an echoing reverberation as part of the gradual, closural dissolution. From a performer’s point of view, dynamics, articulation, phrasing, pedaling, and rubato can all help bring out the remarkable trajectory of this final dance and its subtle play with closure. The formal and expressive “overflow” of the waltz’s own form is achieved through an extraordinary transformation from hesitancy to bright conviction. This surprising epiphany fully reverses the previously final, tragic coda of no. 17, providing an expressive closure more suited to the mixed emotional terrain of the cycle. In my performance (Audio Example 2), I interpret the “Nicht schnell” tempo marking of no. 18 as properly cautionary, not just for the magical transition’s necessary rubato, but for the hesitancy of the waltz proper. (24) Since that hesitancy is best conveyed through articulation and internal rubato, I attempt to keep the pacing of measures rather steady. The harmonic urgency of the B section is reflected in a slight accelerando, so that the marked ritard will regain the original tempo for the return of the introductory chord and A′ section of the waltz. At the moment of formal overflow, marked in measure 26 by a subito mf, I project the sense of a sudden insight through nuanced timing and dynamics. I allow the repeated gesture and accentual saturation to affect my tempo, as I gradually accelerate with emotional excitement, responding to an impending sense of epiphany. But I only touch the pedal on the downbeats for the first wave of this epiphany, maintaining articulatory separation between the bass and the accented octaves or chords in the left hand. When the varied expansion in measure 35 “frees” the right hand from its insistence on 2ˆ, I accelerate even further to convey a more free-wheeling and rollicking experience of ecstatic joy, now more fully pedaling each measure to create a blur of excitement. My larger arm gestures enhance the depth of sound, ideally without overdoing the dynamics; visually, these arm gestures serve to support the windmilling effect of the cadential expansion. The accented repeating Ds in the tenor foreshadow the tolling Cs at the end (the Ds appear in two sets of six, in measures 27–32 and 35–40); thus, they may also be brought out for their programmatic significance. The third beat of each of these measures receives emphasis due to the initiation of the slurred figure, which is also emphasized by Schumann’s hairpins. In anticipation, I slightly exaggerate the cross-accentuation, derived from the opening of the waltz in measure 3, as an internal rubato against the steady measure-pulse. The metrically dissonant interpretive layer (Krebs 1999) resolves at the cadence in measure 33 and is then “reset” by the marked sf of the plagal echo in measures 33–34. At the second cadence, in measure 41, the alto offers another overflow, this time melodic. The alto is answered and in effect displaced by the soprano line at the end of measure 43. The leading melodic line then shifts at the cadence in measure 49 to the tenor and ultimately to the bass at the end of measure 53. During this progressive dissolution of the thematic texture, I begin a decrescendo earlier than marked in the score, and I also anticipate the ritard marked for the final melodic echo in the bass. A more subtle rubato in measures 41–42 attends my performance of this “afterglow” plagal response to the bass cadence. When the alto melody takes over at that cadence, there is an effect of going over the top of a wave, rather than a closural stoppage. Such effects may be found in Bach and Mozart, where closure elides with plagal extension, but never with quite this sense of melodic overflow—and my interpretation of a continually affirming epiphany serves to guide my rubato as I spin over this point of closure. To summarize, Chopin and Schumann, just like Beethoven and others before, found ingenious means not merely to prolong closure, but to do so in a way that enhances the expressive trajectory of a work (whether a prelude, a waltz, or an entire cycle). The rhetorical play with tonal and formal closure suggests that harmony and voice-leading are not the sole determinants of closure, but that they can be manipulated to serve more complex expressive ends. With this knowledge, a performer may more effectively participate in a dramatic play of closures—emphasizing an illusory cadence only to shift dramatically to the actual cadence, as in the Chopin, or emphasizing a definitive cadence only to shift dramatically to another entire waltz that in turn overflows its formal scheme, as in the Schumann. The potential for these shifts to create new levels of discourse may in turn support Romantic irony, in which a narrative agency comments on the discourse. Or they may move inward to support a deeper expressive effect of dramatic recognition or epiphany on the part of a central protagonist. Either way, expressive considerations motivate the play of closures: an illusory cadence may create a strong sense of expressive closure by miming a structural function it does not literally possess, as in the Chopin, or strong structural and expressive closure may be overturned to create the effect of emotional overflow leading to epiphany, as in the Schumann. A performer who is aware of a variety of expressive closures, and has a sense of their significance, may find still other ways to project their contributions to a dramatic trajectory. But however one performs the ambiguities and reversals of multiple expressive closures, I would recommend working toward spontaneity. For it is only a hard-won spontaneity that can re-enact the flow of consciousness, and reflect the more fragile coherence of a complex human subjectivity in these works. Whether existential, as in the Chopin, or transcendent, as in the Schumann, expressive closures move beyond conventional tonal and formal closures in order to convey the more subtle psychological and spiritual dramas of the human condition. Brown, Clive. 1999. Classical and Romantic Performing Practice 1750–1900. Oxford: Oxford University Press. Daverio, John. 1997. Robert Schumann: Herald of a “New Poetic Age.” Oxford: Oxford University Press. Gjerdingen, Robert O. 2007. Music in the Galant Style. Oxford: Oxford University Press. Hatten, Robert S. 1987. “Aspects of Dramatic Closure in Beethoven: A Semiotic Perspective on Music Analysis via Strategies of Dramatic Conflict.” Semiotica 66, nos. 1–3: 197–210. —————. 1994. Musical Meaning in Beethoven: Markedness, Correlation, and Interpretation. Bloomington: Indiana University Press. Hatten, Robert S. 2004. Interpreting Musical Gestures, Topics, and Tropes: Mozart, Beethoven, Schubert. Bloomington: Indiana University Press. —————. 2004. Interpreting Musical Gestures, Topics, and Tropes: Mozart, Beethoven, Schubert. Bloomington: Indiana University Press. Hatten, Robert S. 2009. “Opening the Museum Window: Improvisation and Its Inscribed Values in	Canonic Works by Schumann and Chopin.” In Contemplating Improvisation in Music: Art, Society, Education, ed. Bruno Nettl and Gabriel Solis, 281–95. Urbana and Chicago: University of Illinois Press. —————. 2009. “Opening the Museum Window: Improvisation and Its Inscribed Values in	Canonic Works by Schumann and Chopin.” In Contemplating Improvisation in Music: Art, Society, Education, ed. Bruno Nettl and Gabriel Solis, 281–95. Urbana and Chicago: University of Illinois Press. Kaminsky, Peter. 1989. “Principles of Formal Structure in Schumann’s Early Piano Cycles.”	Music Theory Spectrum 11, no. 2: 207–25. Kerman, Joseph. 1982. “Notes on Beethoven’s Codas.” In Beethoven Studies 3, ed. Alan Tyson,	141–59. Cambridge: Cambridge University Press. Kramer, Lawrence. 1990. Music as Cultural Practice, 1800–1900. Berkeley: University of	California Press. Meyer, Leonard B. 1956. Emotion and Meaning in Music. Chicago: The University of Chicago Press. Morgan, Robert P. 1993. “Coda as Culmination: The First Movement of the ‘Eroica’	Symphony.” In Music Theory and the Exploration of the Past, ed. Christopher Hatch and	David W. Bernstein, 357–76. Chicago and London: The University of Chicago Press. Richter, Jean Paul. (1801) 1964. Flegeljahre. Stuttgart: Reclam. Rosen, Charles. 1995. The Romantic Generation. Cambridge, MA: Harvard University Press. Schachter, Carl. 1999. “The Triad as Place and Action.” In Unfoldings: Essays in Schenkerian	Theory and Analysis, ed. Joseph N. Straus, 161–83. Oxford: Oxford University Press. Originally published in Music Theory Spectrum 17, no. 2 (1995): 149–69. Schenker, Heinrich. (1906) 1954. Harmony, ed. Oswald Jonas, trans. Elizabeth Mann Borgese. Chicago: The University of Chicago Press. Originally published as Harmonielehre. Stuttgart: J.G. Cotta’sche Buchhandlung nachfolger. —————. (1922) 2004. “Beethoven’s Sonata in F Minor, Op. 2, No. 1.” In Der Tonwille: Pamphlets in Witness of the Immutable Laws of Music, Volume I, ed. William Drabkin, trans. Joseph Dubiel, 72–95. Oxford: Oxford University Press. Originally published in Tonwille 2: 25–48. Zenkin, Konstantin. 2010. “Genre as a Carrier of Meaning and Value in F. Chopin’s World.”	Paper delivered to the XI International Congress on Musical Signification, Kraków, Poland, September 27–October 2. 1. For similar perspectives on the important thematically closural functions of Beethoven’s codas, see Kerman 1982 and Morgan 1993. 2. In his graph of the first movement in Tonwille 2, Schenker (2004, 73) brackets the descending sixth in the theme, also noting its structural use in the transition (transposed to E –G), and showing its ultimate resolution in the last bar of the movement. Although the concept of the Ursatz does not appear this early, Schenker is clearly working out the Urlinie concept from structural motivic lines (here, combined with a structural stepwise ascent that he will later relegate to the Anstieg as anacrusis to the Kopfton marking the beginning of the Urlinie). This sonata movement’s motivic descent serves to illustrate what he will later hypostasize as a 5-line. Without an Ursatz, we cannot know for sure where Schenker would have placed his definitive closure, but presumably it would have been at measure 140 (near the end of the recapitulation, just before the codetta and subsequent coda). In his graph he brackets a stepwise descent of a fifth from C to F supported by V–I at that point. In the short coda (measures 146–52), his Roman numerals (see Example 1) are clearly too dissonant to form consonant (Ursatz) harmonic support for his bracketed Urlinie. He does not comment on the (partially chromatic) parallel tenths the Urlinie forms with the bass, although, as Karen Bottge pointed out to me, his ninth-chord Roman numerals imply that he is aurally retaining each Urlinie pitch into the following chord, producing a 10–9 linear intervallic progression between bass and soprano. Schenker refers to the final descent as “a last full-fledged unrolling of the falling fifth-progression c3–f2, suitable for a coda, and the basic feature of the movement accompanies even this one to the very end!” (Schenker  2004, 76). This comment suggests Schenker’s concern for what I have called thematic closure, but the (previously unresolved) motivic descent of a sixth has already been “normalized” in his thinking to a paradigmatic descending fifth, without any mention of the extraordinary heightening of dissonance that “sums up” the drama just prior to the descending sixth’s chromatically-harmonized descent and ultimate resolution to F.
3. The Prelude in E minor, op. 28, no. 4, is a companion piece in its tragic obsessiveness; Carl Schachter (1999, 163–64) hears it “as a vision of death, perhaps the imagination of one’s own death” and finds that “death is evoked in measure 23 in the rest with fermata before the final cadence.” In the A-minor Prelude, by contrast, I infer a virtual agent experiencing emotions with respect to another’s death, in the context of ritual mourning, as marked by the evocation of a funeral procession. 4. Mussorgsky may have had this Prelude in mind when he wrote the “Bydlo” movement from Pictures at an Exhibition (1874). 5. The German first edition (Leipzig: Breitkopf und Härtel, July 1839) retains this beaming, whereas the slightly later French first edition (Paris: Ad. Catelin & Co., August 1839, with Chopin’s dedication to Pleyel) surprisingly does not. See Chopin’s First Editions Online (www.cfeo.org.uk) for a comparison. For a similar example featuring the four-note incipit of the Dies irae as intertextual support for a tragic expressive premise, compare the opening of Brahms’s Intermezzo in E minor, op. 118, no. 6. Whereas Brahms begins with the exact scale-degree and intervallic transposition, Chopin reserves exact scale-degree placement for the end (measures 15–16), with the ultimate arrival in A minor—perhaps suggesting a late tragic “recognition,” dramatically. 6. This intertextual effect was also noted by Konstantin Zenkin (2010), as well as by Steve Grazzini, my former student at Indiana University. Long ago, I noticed that Alban Berg used the same three-note motive for a bardic, narrative, and lament reference in the opening violin motive in Wozzeck, Act III, scene 1, to introduce the guilt-tormented Marie, who is seeking consolation by reading the (narrative) biblical account of Jesus’s forgiveness of the adulterous woman. 7. The unusual tonal design of this Prelude has garnered much analytical attention. Schenker (1954, 252) claimed that the Prelude begins in G major (with an auxiliary cadence in which E minor is vi of G). Leonard B. Meyer (1956, 93–97) concurs, analyzing the Prelude in terms of three varied sequential phases (in G major, D major, and A minor), illustrating a process whose dissonant harmonic distortion in the second phase illustrates “the importance of doubt and uncertainty in the shaping of aesthetic affective experience” (96). Lawrence Kramer (1990, 84–85) goes further, in his more hermeneutic analysis, to interpret “the structure of concentrated anticipation at the core of the A-minor Prelude” as “refashion[ing] the tonic of the Classical style in the image of desire.” He considers the Prelude as a whole as an example of an “impossible object” (just as the tonic is here an impossible object of desire) in that the Prelude’s excessive deformity, strangeness, and resulting fascination for the listener serve to position it among a group of similar cultural products in art and literature. Although my own interpretation is rather different, I share with Kramer a concern for the “interiority of the Romantic subject” (97) that the Prelude’s expressive character and deferred tonal processes imply. 9. For more on the concept of abnegation, see Hatten 1994, 59–63, and 281–86. 10. I will discuss the significance of the sostenuto when I address performance issues, below. 11. See Hatten 1994, 67–90 for the concept of expressive genre, which may be defined as the generic expressive trajectory of a movement. Formal genres (sonata, variations, fugue, character piece) are not limited to single expressive genres, and a given expressive genre may be realized in different formal genres. 12. This slurring is consistent in all three first editions. 13. The split slur interpretation appears as well in the Peters/Scholz (1879), Schlesinger/Kullak (1882), and Universal/Pugno (1905) editions. The Bock & Bock/Klindworth (1880) edition has an even more split slur, plus the piano marking with hairpins. The Schirmer/Mikuli (1895) edition, on the other hand, follows the first editions in reproducing a single slur. I am grateful to David Kopp for this information. 14. For other examples of shifts in level of discourse, see Hatten 1994, 175–76, 180–84, and 199–201. 15. For more on narrative agency, see Hatten 2004, 226. 16. Chopin adds smorz. at the deceptive cadence in measure 21 of the Prelude in E minor, no. 4, leading to a similar deathly silence in measure 23 (see footnote 3, above, for Schachter’s interpretation of this moment as suggesting death). The indication smorzando e slentando appears near the end of the Prelude in D major, no. 15, whereas dim. e smorz. is found at the end of the Prelude in F major, no. 23. 17. In the Prelude in B minor, no. 6, sostenuto implies an expressive broadening of sixteenths in the bass leading to the cadences in measures 17 and 21. 18. This chord in the same register will return to launch the stoically acceptant Prelude in E major, no. 9. 19. Compare Peter Kaminsky’s (1989, 220) outline of “tonal cross references and overall form” (Example 8 in his article), which highlights Schumann’s structural use of the keys of G, B minor/major, and C major in each half of the cycle. 20. The coda in no. 17 may suggest a musical analogue to the drama at the masked ball near the end of Jean Paul’s Flegeljahre (Richter  1964), in which Vult (disguised as his twin, Walt), steals Walt’s beloved Wina, leaving him tragically alone. For an English translation of the penultimate chapter of Flegeljahre (no. 63, entitled “Titanium—Black Tourmaline—Masked Ball”), see the Appendix in Daverio 1997, 493–501. In any case, Schumann explicitly marks the end of no. 17 with “F. u. E.,” indicating that both protagonists are involved in its drama. 21. A similar dominant seventh over tonic drone fifth opens the sixth song of Frauenliebe und Leben (“Süsser Freund”), where it suggests the bliss of the mother’s gaze over her child in the cradle. In the last (16th) song of Dichterliebe (“Die alten, bösen Lieder”) the same harmonic aggregate launches a transcendent coda in major that recalls in memory the yearning postlude to no. 12, “Am leuchtenden Sommermorgen.” The source of this style type is probably the Classical galant cadence, where an entire dominant (-seventh) chord is suspended, as an appoggiatura, over the tonic resolution in the bass. Thus, it is easy to interpret the effect as one of “suspension”—in time and affect. 22. This is Riepel’s familiar Fonte schema, as described in Robert Gjerdingen’s (2007, 61–71) exhaustive study of Classical schemata. 23. See Hatten 2009, 289 for more on the improvisatory nature of this passage. 24. Reasonable quality speakers or headphones are required to hear the continuity of sound between the two dances in my performance. For similar perspectives on the important thematically closural functions of Beethoven’s codas, see Kerman 1982 and Morgan 1993. In his graph of the first movement in Tonwille 2, Schenker (2004, 73) brackets the descending sixth in the theme, also noting its structural use in the transition (transposed to E –G), and showing its ultimate resolution in the last bar of the movement. Although the concept of the Ursatz does not appear this early, Schenker is clearly working out the Urlinie concept from structural motivic lines (here, combined with a structural stepwise ascent that he will later relegate to the Anstieg as anacrusis to the Kopfton marking the beginning of the Urlinie). This sonata movement’s motivic descent serves to illustrate what he will later hypostasize as a 5-line. Without an Ursatz, we cannot know for sure where Schenker would have placed his definitive closure, but presumably it would have been at measure 140 (near the end of the recapitulation, just before the codetta and subsequent coda). In his graph he brackets a stepwise descent of a fifth from C to F supported by V–I at that point. In the short coda (measures 146–52), his Roman numerals (see Example 1) are clearly too dissonant to form consonant (Ursatz) harmonic support for his bracketed Urlinie. He does not comment on the (partially chromatic) parallel tenths the Urlinie forms with the bass, although, as Karen Bottge pointed out to me, his ninth-chord Roman numerals imply that he is aurally retaining each Urlinie pitch into the following chord, producing a 10–9 linear intervallic progression between bass and soprano. Schenker refers to the final descent as “a last full-fledged unrolling of the falling fifth-progression c3–f2, suitable for a coda, and the basic feature of the movement accompanies even this one to the very end!” (Schenker  2004, 76). This comment suggests Schenker’s concern for what I have called thematic closure, but the (previously unresolved) motivic descent of a sixth has already been “normalized” in his thinking to a paradigmatic descending fifth, without any mention of the extraordinary heightening of dissonance that “sums up” the drama just prior to the descending sixth’s chromatically-harmonized descent and ultimate resolution to F.
The Prelude in E minor, op. 28, no. 4, is a companion piece in its tragic obsessiveness; Carl Schachter (1999, 163–64) hears it “as a vision of death, perhaps the imagination of one’s own death” and finds that “death is evoked in measure 23 in the rest with fermata before the final cadence.” In the A-minor Prelude, by contrast, I infer a virtual agent experiencing emotions with respect to another’s death, in the context of ritual mourning, as marked by the evocation of a funeral procession. Mussorgsky may have had this Prelude in mind when he wrote the “Bydlo” movement from Pictures at an Exhibition (1874). The German first edition (Leipzig: Breitkopf und Härtel, July 1839) retains this beaming, whereas the slightly later French first edition (Paris: Ad. Catelin & Co., August 1839, with Chopin’s dedication to Pleyel) surprisingly does not. See Chopin’s First Editions Online (www.cfeo.org.uk) for a comparison. For a similar example featuring the four-note incipit of the Dies irae as intertextual support for a tragic expressive premise, compare the opening of Brahms’s Intermezzo in E minor, op. 118, no. 6. Whereas Brahms begins with the exact scale-degree and intervallic transposition, Chopin reserves exact scale-degree placement for the end (measures 15–16), with the ultimate arrival in A minor—perhaps suggesting a late tragic “recognition,” dramatically. This intertextual effect was also noted by Konstantin Zenkin (2010), as well as by Steve Grazzini, my former student at Indiana University. Long ago, I noticed that Alban Berg used the same three-note motive for a bardic, narrative, and lament reference in the opening violin motive in Wozzeck, Act III, scene 1, to introduce the guilt-tormented Marie, who is seeking consolation by reading the (narrative) biblical account of Jesus’s forgiveness of the adulterous woman. The unusual tonal design of this Prelude has garnered much analytical attention. Schenker (1954, 252) claimed that the Prelude begins in G major (with an auxiliary cadence in which E minor is vi of G). Leonard B. Meyer (1956, 93–97) concurs, analyzing the Prelude in terms of three varied sequential phases (in G major, D major, and A minor), illustrating a process whose dissonant harmonic distortion in the second phase illustrates “the importance of doubt and uncertainty in the shaping of aesthetic affective experience” (96). Lawrence Kramer (1990, 84–85) goes further, in his more hermeneutic analysis, to interpret “the structure of concentrated anticipation at the core of the A-minor Prelude” as “refashion[ing] the tonic of the Classical style in the image of desire.” He considers the Prelude as a whole as an example of an “impossible object” (just as the tonic is here an impossible object of desire) in that the Prelude’s excessive deformity, strangeness, and resulting fascination for the listener serve to position it among a group of similar cultural products in art and literature. Although my own interpretation is rather different, I share with Kramer a concern for the “interiority of the Romantic subject” (97) that the Prelude’s expressive character and deferred tonal processes imply. For more on the concept of abnegation, see Hatten 1994, 59–63, and 281–86. I will discuss the significance of the sostenuto when I address performance issues, below. See Hatten 1994, 67–90 for the concept of expressive genre, which may be defined as the generic expressive trajectory of a movement. Formal genres (sonata, variations, fugue, character piece) are not limited to single expressive genres, and a given expressive genre may be realized in different formal genres. This slurring is consistent in all three first editions. The split slur interpretation appears as well in the Peters/Scholz (1879), Schlesinger/Kullak (1882), and Universal/Pugno (1905) editions. The Bock & Bock/Klindworth (1880) edition has an even more split slur, plus the piano marking with hairpins. The Schirmer/Mikuli (1895) edition, on the other hand, follows the first editions in reproducing a single slur. I am grateful to David Kopp for this information. For other examples of shifts in level of discourse, see Hatten 1994, 175–76, 180–84, and 199–201. For more on narrative agency, see Hatten 2004, 226. Chopin adds smorz. at the deceptive cadence in measure 21 of the Prelude in E minor, no. 4, leading to a similar deathly silence in measure 23 (see footnote 3, above, for Schachter’s interpretation of this moment as suggesting death). The indication smorzando e slentando appears near the end of the Prelude in D major, no. 15, whereas dim. e smorz. is found at the end of the Prelude in F major, no. 23. In the Prelude in B minor, no. 6, sostenuto implies an expressive broadening of sixteenths in the bass leading to the cadences in measures 17 and 21. This chord in the same register will return to launch the stoically acceptant Prelude in E major, no. 9. Compare Peter Kaminsky’s (1989, 220) outline of “tonal cross references and overall form” (Example 8 in his article), which highlights Schumann’s structural use of the keys of G, B minor/major, and C major in each half of the cycle. The coda in no. 17 may suggest a musical analogue to the drama at the masked ball near the end of Jean Paul’s Flegeljahre (Richter  1964), in which Vult (disguised as his twin, Walt), steals Walt’s beloved Wina, leaving him tragically alone. For an English translation of the penultimate chapter of Flegeljahre (no. 63, entitled “Titanium—Black Tourmaline—Masked Ball”), see the Appendix in Daverio 1997, 493–501. In any case, Schumann explicitly marks the end of no. 17 with “F. u. E.,” indicating that both protagonists are involved in its drama. A similar dominant seventh over tonic drone fifth opens the sixth song of Frauenliebe und Leben (“Süsser Freund”), where it suggests the bliss of the mother’s gaze over her child in the cradle. In the last (16th) song of Dichterliebe (“Die alten, bösen Lieder”) the same harmonic aggregate launches a transcendent coda in major that recalls in memory the yearning postlude to no. 12, “Am leuchtenden Sommermorgen.” The source of this style type is probably the Classical galant cadence, where an entire dominant (-seventh) chord is suspended, as an appoggiatura, over the tonic resolution in the bass. Thus, it is easy to interpret the effect as one of “suspension”—in time and affect. This is Riepel’s familiar Fonte schema, as described in Robert Gjerdingen’s (2007, 61–71) exhaustive study of Classical schemata. See Hatten 2009, 289 for more on the improvisatory nature of this passage. Reasonable quality speakers or headphones are required to hear the continuity of sound between the two dances in my performance.